Check out our award winning white wine! Our Sauvignon Blanc just won bronze in the South West Vineyard Association Awards for unoaked dry white wine. 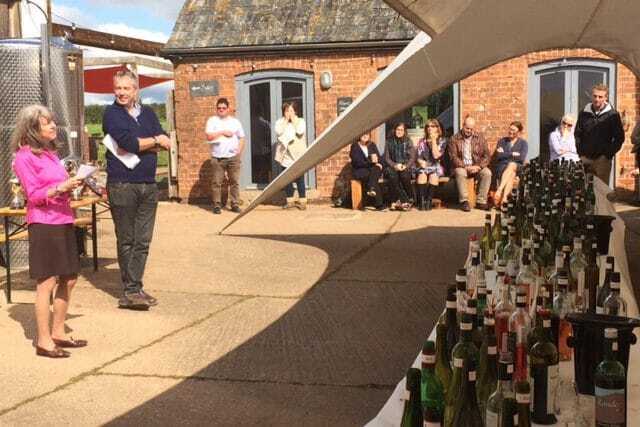 Judging took place today, Monday 11 September at Pebblebed Vineyard near Exeter for the South West Vineyards Association’s annual competition for its members’ West-Country-grown wines. The team of six judges was led by Patricia Stefanowicz MW. Other judges were Lindsay Oram, Alastair Peebles MW, Tim Johnson, Gemma Mitchell and Richard Coulson. Wines are divided into classes: Dry white, with separate divisions for oaked wines and wines from the Bacchus grape, medium dry and medium sweet whites, rosé, red, sparkling and sparkling rosés. This year there were just over 100 entries, with more reds and less whites in comparison to past years. Results of the 2017 competition were announced on 12th September at a members’ meeting and awards ceremony at Pebblebed Vineyard. Wines are judged “blind” – each wine has its entry number on its neck and is shrouded in a black bag so that it is not identifiable by the judges. Numbers are known only to the competition organisers. This is the first time we’ve entered a wine for an Award and this early success is really encouraging.